People think that pressure-treated wood is protected from termites and decay, so they can use it with abandon. 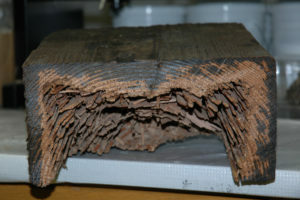 While that might be true in the short term, even pressure-treated wood is susceptible to termites in the long term. Construction codes in the U.S. state that pressure-treated wood is considered to be “termite-resistant”, not “termite-proof”. 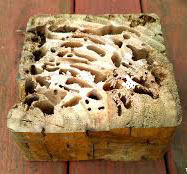 Pressure-treated wood is wood that has had a chemical preservative forced into the pores by vacuum-pressure to form a barrier that resists decay and wood-eating insects like termites and carpenter ants. Wood preservatives penetrate sapwood easier than heartwood, so woods with a higher percentage of sapwood (like Southern pine) are used most often. 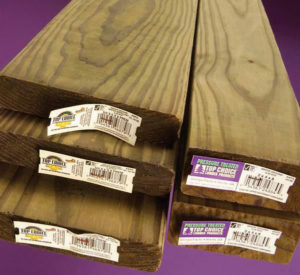 Treated woods are rated for different uses based on both the penetration and the expected retention of the preservative. Most treated wood that is 2 inches or less in thickness is rated for above-ground uses and does not last as long when there is soil contact. Building codes may require that pressure-treated lumber be used in construction for below-ground installations and wherever wood will be touching soil. It is commonly used for decking, fence posts, mailbox or light posts, trellises, and gazebos. The Protection Doesn’t Last Forever. The preservative chemicals in the treated wood slowly leach out of the wood over a period of 7-10 years. The outer one inch of the wood seems to retain its protection, while the inner wood becomes vulnerable. If there is any kind of crack or hole where termites can bypass the still protected outer surface and enter the inner wood, all bets are off. Termites will also build mud tubes over the surface of pressure-treated wood to reach untreated wood. Part of the problem is that when pressure-treated wood is used in construction, there will be new cut wood ends, as well as new notches and drill holes that are not protected by the surface preservative. This newly exposed wood is supposed to be treated with preservative onsite by the contractor or homeowner. Of course, this rarely happens. 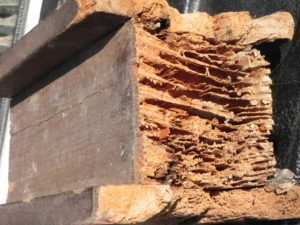 Termites will eat pressure-treated wood if the wood is old enough that it has lost some of its protection, if they can find an untreated edge, if the wood stays damp enough for long enough and starts to rot, or if there is no other wood available. The bottom line? Any wood, pressure-treated or not, that is directly in contact with soil will likely rot eventually and become susceptible to termite and carpenter ant attack.